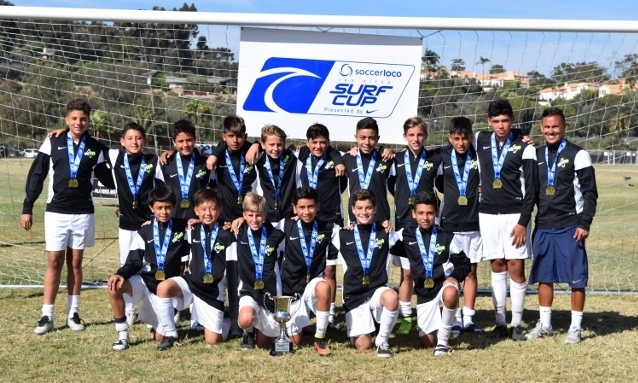 Congratulations to the Fullerton Rangers B02 White team for winning the Surf Cup B13 “Super Cup” division championship! Playing in one of the most prestigious youth soccer tournaments in the country, the Rangers proved that they were “Best of the Best” by winning their bracket in pool play and then defeating three nationally ranked teams during the elimination round. This is their 4th tournament title in a row, having recently won the Manchester City FC Americas Cup, Las Vegas Premier Invitational and Rangers Classic tournaments. Congratulations to Coach Jimmy and the boys for a job well done!